Having been frustrated by the short-lived experience with the Garmin Fenix, I started looking around for alternatives. Garmin’s Vivoactive was ticking all of the right boxes and was getting good reviews, but I was reluctant to commit to another Garmin ‘trial’ – I need to be recording my training, not trying to work out how a new gadget should function. Suunto were offering some good options and there are some interesting sounds coming from Fitbit, but in the end I opted for a Polar M400. I’ve used a Polar H7 bluetooth heart-rate monitor (in conjunction with an iphone) very successfully for a couple of years and have had other Polar monitors in the past, so I was confident going with this brand. 1 – The watch happily records a run or cycle ride and can be synced into the Polar Flow app. Getting the route from Polar Flow to Strava has been a little hit-and-miss – I have the two connected, so in principle any route loaded to Flow should automatically update in Strava, but this didn’t happen on Saturday, so I had to manually export the RCX file from Flow and load it into Strava. 2 – The Polar M400 uses a chest strap heart-rate monitor, rather than the newer wrist monitors, but I’m happy with this… I haven’t seen any science to support my gut-feel, but I suspect that the wrist monitors probably drain the watch battery faster, so reduce the potential record time. 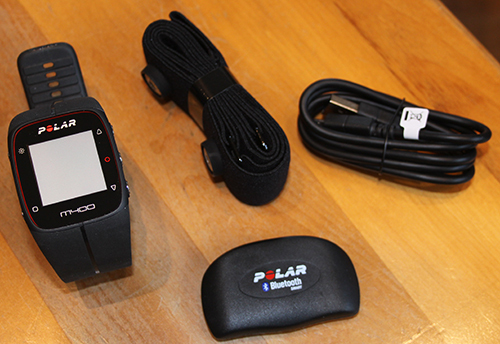 In terms of what’s recorded, anyone who’s used a Polar heart-rate monitor, especially the iPhone-connected monitors, will be familiar with the Polar app for displaying the information recorded – it’s all shown in a neat and easily understood format. o Battery time – The watch is charged from a USB port and lasts nearly a month if you’re not using the GPS or heart-rate functions. Even once you’ve started tracking routes and exercise sessions, you’re still getting 8 or so hours of use, which is plenty at my level. o Ease of use – Probably because of its incredible capability, the Garmin was an intimidating device to navigate with just four buttons, so you’d expect the Polar watch to be easier to use as it’s much simpler and you’d be right. There are three buttons on the right of the watch face which you use to drill down into menus, and the lower of the two left-hand buttons to navigate back ‘up’ the menus…simples! o Day-to-day – The M400 isn’t an unattractive watch to wear all-day and I’ve set the watch-face to display the time in huge digits. If you’re interested, the M400 also has an activity tracker monitoring your movement day and night. o Exercise options – My exercise regime is based around gym/spin sessions, swimming, cycling and running and, with the exception of the swimming, the M400 does all of these in three separate exercise profiles – Indoor, Running and Cycling. The Indoor option captures your heart-rate, but no GPS, whereas the Cycling and Running captures both your heart-rate and GPS route details. There is another ‘Other Outdoor’ profile on the watch and options to set-up further exercise profiles using Polar Flow, a GPS option with no heart-rate might be handy for longer cycle rides, but I haven’t explored that yet. 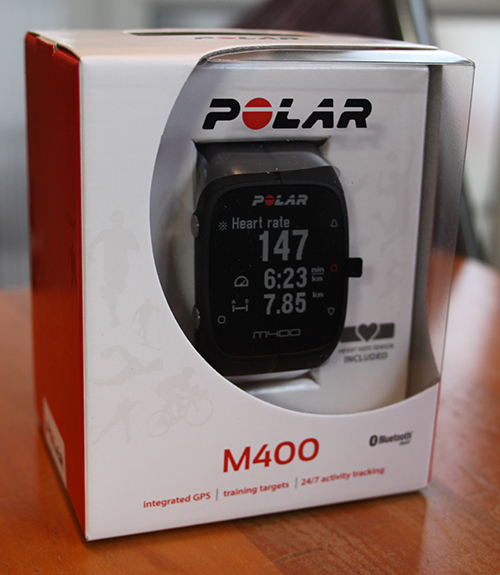 I’m really happy with the Polar M400… it’s ticking all of my boxes and, apart from that Strava-sync query, it hasn’t given me any hassle so far… so it gets the Mombee seal of approval.